This entry was posted on Sunday, January 13th, 2019 at 10:26 am and is filed under News. You can follow any responses to this entry through the RSS 2.0 feed. You can leave a response, or trackback from your own site. My favorite Eric Glesser designs have always been the Manix series. I got to handle Werner’s Manix 2 lockback, and I have to say it is my favorite iteration of Manix. There’s just something about the solid back and the way they’ve really improved the way they conceal the H where the blade meets the lockbar using jimping. I liked it so much that I picked up one of my own. 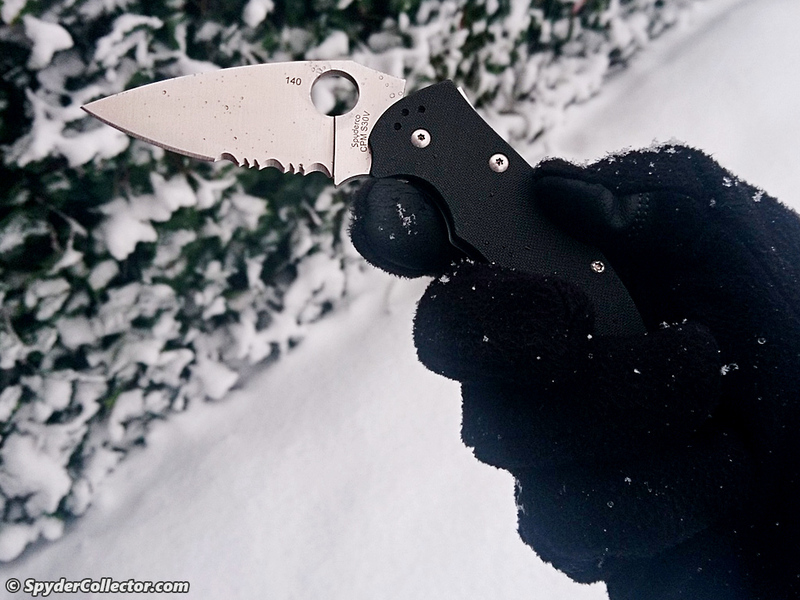 Lockbacks are definitely underappreciated, especially Spyderco lockbacks; too many people think lockbacks are necessarily 2 handed closers which is the main reason they don’t likely them, but every Spyderco lockback I’ve seen is designed smartly as a fully 1 hand operation knife, opening and closing. Can’t go wrong with a Spyderco lockback. Thank you Brian, and good point about the one-handed closing, I forgot about that one. Thanks! I don’t mind lock backs as I never really abuse my knives, and I never had a lock back fail when using them. One thing I like about lock backs is when the knife is closed, the blade will tend to have a bias towards the closed position. Open the blade a little bit and the lock bar spring will keep the blade safely tucked in. My first locking folder was a Buck Ranger bought in the early 1970s. I still have it. Locks securely every time. I too consider Spyderco’s lock backs the best available. As Brian pointed out, they easily open and close with one hand and I appreciate the bias to stay closed. Recently I reached the point where I don’t care about locks at all. I have replaced nearly all of my Spydercos with a few Great Eastern Cutlery slip joint, multi-blade pocket knives. No locks, no clips. Bone or wood scale covers. Knives actually made by hand on old machinery from American patterns 100 years old and more. The quality is first rate. When I see (thank you YouTube) local people turning out these little masterpieces in about 200 separate operations the one I hold in my hand has more meaning than a Para 3 Ora Chaparral.